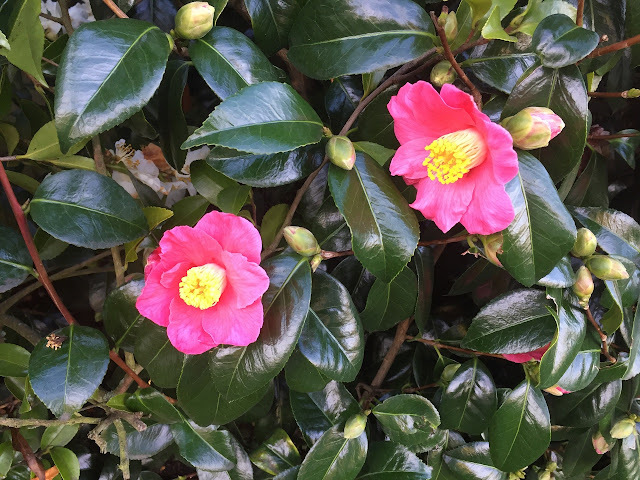 Days are longer and the camellias are in bloom. Lee Lageschulte took this photo in west Shoreline. Seattle Poppy sent me an almost identical photo from a camellia near the Shoreline Library. Now I need one from Lake Forest Park to make it official. I have jonquil sprouts six inches out of the ground. I'd say we were shaking off the winter, but we had another mild winter so there wasn't much to shake off. Of course, we've had snow in April a couple of times and last weekend's rain produced puddles big enough for a duck pond, so it's not quite all over.